Would you like to become a volunteer citizen scientist helping to document and analyze California's rich biodiversity? If so, you can be among 1,000 volunteers who will collect 18,000 samples of soil and aquatic sediment from across the state through a new University of California program called CALeDNA that intends to revolutionize conservation in California by the end of this year. Volunteers who sign up on the program's website will receive training, a sample collection kit and a phone app to guide them. The program's scientific team hopes about half of the participants will deploy the kits on hikes in any of the 39 UC natural reserves, and that the other half will sample broadly across California's stunning and fragile ecosystems. CALeDNA will hold several "BioBlitz" events; the first will be held on Feb. 8 at Northern California's Pillar Point near Half Moon Bay. To figure out what lives in a place—for example, from an undeveloped lot in the desert, a grassland being considered for cattle range or a patch of coastal sage scrub experiencing drought —teams of life scientists have traditionally had to survey the area intensively for up to four years, but they still could not identify everything. By using DNA-sequencing technology that traditionally has been used to inventory species in marine systems, CALeDNA scientists will be able to reconstruct an entire habitat from a vial of soil. The kit samples will be sent to a team of UCLA molecular biologists, who will extract DNA and prepare the sample for permanent archiving. This technique captures fragments of DNA, called environmental DNA or eDNA, from cells shed by animals as they scamper by, from plants as fallen leaves compost, and from all the small critters, bacteria and fungi that live underground. High-tech DNA sequencers generate hundreds of thousands of DNA barcodes that scientists will compare to a global database of all barcodes of life. They can then extrapolate hundreds of species with even a trace amount of DNA in a gram of soil. 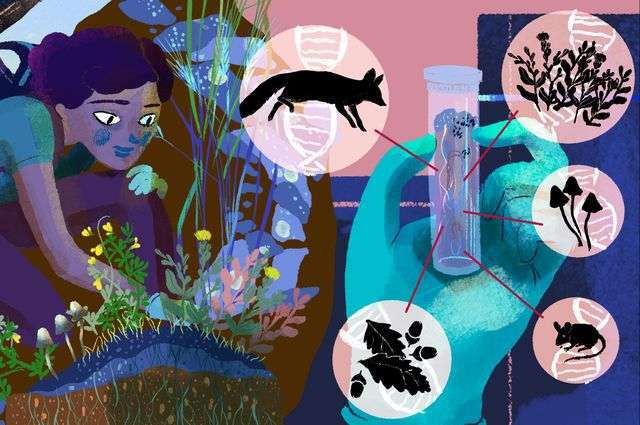 The CALeDNA program was created under the UC Conservation Genomics Consortium supported by UC President Janet Napolitano's catalyst grant program. "With more extreme climate sweeping the state, and nearly 1,000 species on endangered or watch lists, California can't afford to wait to take action," said Robert Wayne, a UCLA professor of ecology and evolutionary biology who is leading the consortium. Conservation International has named California as one of the world's biodiversity hotspots, with a large number of species whose existence is threatened by human activity. California's wildlife is particularly at risk because more than 70 percent of natural habitat has been lost due to development and land degradation, Wayne said. One of the main challenges facing conservation biologists is effectively monitoring species distribution and establishing reliable baselines of a region's biodiversity—which is critical for early detection of species decline. CALeDNA aims to address these challenges by collecting and analyzing samples to establish a baseline of California's biodiversity. "We will create an environmental DNA museum," Wayne said. CALeDNA will openly disseminate information about its progress with data collection and analysis to make biodiversity monitoring easier and more effective. And you can be a part of this important biodiversity project.